This article covers what you need to know to buy (or even design) a bike frame that can be adapted to meet the needs of a woman. It covers all kinds of bikes, but mostly concentrates on MTBs, racing bikes, and touring bikes. See What to look for in a women's bike for comments on how to adapt this frame so it's perfect for you. There are quite a few challenges associated with selecting a bike for small people (usually women, since women are generally smaller than men). They boil down to the fact the the bike needs to have a top tube that is low enough (allowing you to stand over the bike easily) and has the bars within easy reach (high enough and close enough that you don't have to stretch for them). Women seems to have a worse time than men with getting the bars in easy reach. Many people explain this desire for a shorter reach to the handlebars than is offered by standard bikes by saying that women typically have longer legs and shorter torsos than men of the same height. However, this simply isn't true: statistical studies of dimensions of men and women show that proportionally, men and women have the same length of legs. However, women do have proportionally shorter arms than men, as well as smaller hands. In addition, there is a possibility that women's backs bend differently than men's backs, but I haven't seen any hard evidence to back this up. Even if we assume that women are proportionally exactly the same as men are, we would find that women would still feel more stretched out than men on a bike that is appropriate for their leg length. The reason for this is simply their size, combined with the way that bikes are designed. Let's look at bike geometries. For examples, I will select bikes from the 2001 Trek catalog. Trek are very good in making their bikes in a wide range of sizes, and offering some women's specific (WSD) bikes. I'll use the Trek 4000 series bikes as examples of generic (not women's specific) MTBs, the 2000 series and as examples of generic road bikes, and the 7000-series bikes as examples of generic hybrid bikes. 13" 16.5" 18" 19.5" 21" 22.5" 24"
20.9" 22" 22.8" 23.2" 23.6" 24.0" 24.2"
13" 15" 17.5" 20" 22.5"
21.2" 21.4" 21.6" 21.9" 22.9"
The average man is about 5'10", while the average woman is about 5'4". Bike sizes are generally arranged so that the size of bike that fits the medium sized man falls in the middle of the sizes of bikes. Trek expect that medium sized men will ride the 18" or 19.5" MTBs, while they will ride the 56cm or 58cm road bikes and the 20" hybrid. In the world of road bikes, medium-sized women can (maybe) fit the smallest bike size, while in the world of MTBs, a medium sized woman fits perhaps the next-to-smallest size of bike,and for hybrids, a medium-sized woman would go for a 15" or 17.5" hybrid. A small woman can't fit a standard road bike at all, while a small woman might be able to fit the smallest size MTB or hybrid. For all types of bikes, note that frame sizes larger than those "medium" sizes have proportionally shorter top tubes (as shown by the last row, the length of top tube divided by frame size, which is the length of the seat tube), while the smaller frames have proportianlly longer top tubes. Thus the smaller frames, the ones that the women will be riding, if they can ride the bikes at all, have proportionally longer top tubes than medium and large frames. This is the major cause of problems when women go to find bikes that fit them. Add in the fact that women in general have shorter arms than men, and it's no surprise that women often find themselves too stretched out on bikes. Please note that I am not picking on Trek! This non-proportionality of top tube lengths is true for all brands of bikes. Also, please note that in the rest of this article I assume that you are looking for a fit similar to what medium-sized men get when they ride their road or mountain bikes. If you are a woman with a long torso for her height, or you like being stretched out, then feel free to ignore all the below advice and simply buy a stock generic bike. The first thing to note is that although pretty much all bike styles have this non-proprtionality of top tube lengths, some bike styles have longer top tubes than others. Actually, amongst MTBs, the Trek 4000-series have fairly short top tubes, while Scotts (and Trek 8000-series bikes) have longer top tubes. So one thing to do is to get a type of bike that comes with a shorter top tube. Another thing you can do is replace the stem that comes with the bike with one that has a higher rise and shorter reach. Check out Bodge Your Bike to Fit for advice on stems and handlebars that will give you a comfy riding position. Warning! different manufacturers have different ways of measuring top tubes. All modern MTBs have sloping top tubes. What you really want to know is, what's the distance from the saddle to the head tube (you can replace the stem so you're not really all that worried about the distance from the head tube to the handlebars). If you measure the actual length of the top tube, this doesn't give you the information you need. What you need to know is "effective top tube length", which is the distance from the intersection of the top tube and head tube, horizontally to where that horizontal line intersects with the seat post (it's the FL measurement in the chart here). Some geomtry charts don't make it clear which top tube measurement they are giving. Trek always uses effective top tube, while for example, Scott at least used to use actual top tube lengths. For any bike with a sloping top tube, the actual TT measurement will be shorter than the effective top tube, so if a chart gives the actual TT measurement, it will look like it has a shorter top tube! If you're uncertain as to what the geometry charts say, take your tape measure along to measure the top tube yourself. One problem with modern MTBs is that almost all of them come with threadless headsets. If the steerer tubes have been left long, so that quite a bit of steerer is showing above the top of the head tube, then you'll have some height adjustment by rearranging spacers. Unfortunately, many manufacturers cut the steerer tubes of the bikes quite short, so that there's just enough space left for the stem. On the latter bikes, there's not much your local shop can do to raise the bars for you, short of replacing the stem. It's worth asking your local shop which manufacturers leave the steerers long, and buying those bikes. When the shop assembles the bike for you, ask them to put lots of spacers under the stem before they cut the steerer. That way you can rearrange the spacers to change the height of your bars, and when you're happy with the position, if you find that you have a few spacers on top of the stem, you can take the bike back to the shop to get them to cut it to just the right length. For comparison, I am 5'5", about medium sized for a woman. I fit quite comfortably on a 16.5" Trek bike, with the following modifications. I've replaced the fork, and I've left space for about 3cm worth of spacers beneath the stem. Furthmore, I use a stem which is about 9cm long (shorter than the supplied one), and has about a 20 degree rise (the supplied stem had very little rise). I can ride this bike all day with no problems. You can see that they still follow the same pattern of smaller bikes having proportionally longer top tubes, but at least the top tubes are shorter than you'd find on the 4000-series bikes of similar size. In addition, Trek WSD bikes have other features useful for women, such as softer suspension settings. How will you know which bike suits you? Try them out! Find a cooperative shop, and get them to let you try out the bikes. Probably they won't let you try them out off-road, but at least going for a short ride around town should give you some idea of whether the bike suits you. A good shop will change them stem for your test ride, too, so don't judge the bike just on the equipment it comes with. For more info on MTB fitting, see part 3 of A beginner's guide to buying a mountain bike. Remember that under the category of "road" bikes, I'm including both the racing style built-for-speed bikes, and touring bikes. Some manufacturers do make bikes with shorter top tubes. For example, Specialized makes a racing-style bike with a top tube that's just under 50cm. This sounds good, but there is a serious problem with this bike: the toe of my shoe would hit the wheel as I turned the front wheel. This is called toe overlap, and it can cause a crash. It is to be avoided if at all possible. Bringing in the front wheel so close that it hits the foot is one way in which manufacturers can make the top tube shorter. Another way is to make the seat tube angle steeper. Some manufacturers try to make a positive point of this, saying that it helps put a woman's hips above the pedals. Er, if this is such a good thing, why isn't it done on men's bikes? For more insight into this, see Peter Jon White's discussion of bike fit, especially the section "The Fore-Aft Saddle position". Since saddle fore-aft position is in part determined by body weight distribution, and a woman's weight is further down than a man's (more in the hips and less in the shoulders) it does make sense to have the saddle slightly further forward on a woman's bike than on a man's bike. However, I find that I'm far more comfortable with my saddle reasonably far back. For awhile I owned a Cannondale racing bike with a seat tube of 74.5 degrees, and I was only comfortable using a saddle with fairly long rails, and pushing the saddle as far back as it would go. Pamela Blalock, a very experienced long-distance rider, shares my dislike of saddles that are too forward. Chris Juden, technical director of the CTC, also suggests that women tend to sit further back on the saddle than men. So I'm not convinced by the argument that steep seat angles are useful for women. The problem with finding a top tube that's short enough is even worse with touring bikes, which usually take bigger tires than racing bikes, and which should have enough toe clearance to allow you to fit a mudguard (aka fender in US-speak). Below I discuss ways to design bikes for women, especially small to medium women. For smaller women, there is even the problem that their legs can't straddle the top tube of a bike designed around 700c wheels. 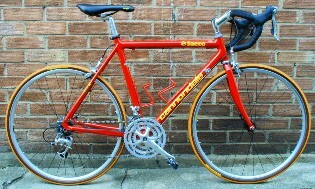 Even though I'm medium-sized I have a related problem with my old touring bike (picture left). I can barely stand over this bike: even with fairly skinny tires the top tube hits my crotch. It certainly is possible to make a 700c bike that I can stand over easily. What's going on here? It took me many years to realize this, but the problem is the height of the bottom bracket: with 28mm tires it's 31cm off the ground! A more usual BB height is 26.5 to 28cm for racing and touring bikes. What has happened here is that in designing a bike with a small frame (49cm seat tube c-t), instead of finding a way to bring the top down, they've instead brought the bottom bracket up. There are several disadvantages of a high bottom bracket. The main one is that a bad design can prevent you from standing comfortably over the frame. (In bike geometry jargon, we say that the standover is too big. The standover is the distance between floor and top of top tube at about midpoint of the top tube, shown as the HT measurement in the chart here.) Minor disadvantages are that you can't put a foot on the ground while sitting in the saddle, and that the center of gravity is higher so that the bike is slightly less stable. Then on the other hand, it is possible to have a bottom bracket too low. I use 165mm cranks, and I find that with a 26cm high BB if I pedal around a sharp corner I can hit the pedal on the ground. Nevertheless, I like bikes with 26cm BBs; I don't tend to pedal around sharp corners, so pedal strike isn't a major issue for me. For someone who uses shorter cranks than I do, a 26cm or less BB height would be ideal. The way to avoid a too-high BB is a sloping top tube. This allows the back end of the top tube to be quite low for a low standover, while the front end is high enough to allow for at least a minimal-sized head tube. When looking at small bikes, check the BB figures. If the BB height is much over 27cm, this is a signal that the manufacurers are trying to shorten the seat tube by raising the BB instead of lowering the TT enough. For these bikes, pay special attention to the standover height, and make sure you have sufficient crotch clearance. Also see if it's possible to put your toe on the ground when you've got the saddle at the right height. If it is important for you to be able to do this, and the bike you're looking at doesn't allow this, look elsewhere for a bike with a lower BB. Here is a bike that solves the problems of fitting a medium-sized woman on a bike with 700c wheels and drop bars. It's the Roberts Compact Clubman to the right. I have loads of standover clearance on this bike. First, I use 165mm cranks. This fact was taken into account in figuring out exactly how close the front wheel can be to the bottom bracket. The bottom bracket is low at 26cm. This helps to get the top tube lower. The top tube slopes quite a bit. This accomplishes several things. First, it makes the standover height lower than a straight top tube would be. Second, it allows a very long head tube. 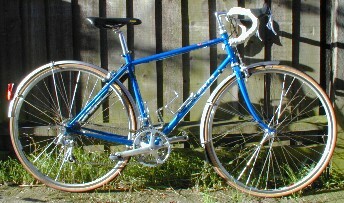 The extremely long head tube allows the handlebars to be raised quite high (level with the saddle) while using a standard stem. The head angle is shallow by today's standards, about 70 degrees. This shoves the front wheel out further from the BB. The fork rake is longer than usual to keep the trail from being too long, and this kicks the front wheel out even further. The seat tube angle is fine at 73 degrees (although the Roberts in the geometry chart has a steeper seat angle at 75 degrees). The difference in the seat tube and head angles, and the fact that the top tube joins the head tube so high up, means that the effective top tube length is very short at 50cm. I personally don't like the looks of this bike very much, but one has to admire the design skill that's gone into it. And the tricks used here can be used to design bikes that look a bit more normal. Perhaps the most obvious way to get a lower, shorter top tube is to use smaller wheels. Since the wheel has a smaller diameter, you can have a decent length head tube and the top tube will still be lower than it was with larger wheels. The top tube can be made much shorter with smaller wheels as well, since the front axle can be brought back much closer to the bottom bracket before the tire starts to touch your toe. However, there is still the problem that the handlebars can be too low. The stem shown in the picture of the Cannondale, left, is not the original stem. I installed one with quite a bit of rise to bring the handlebars closer to level of the saddle. 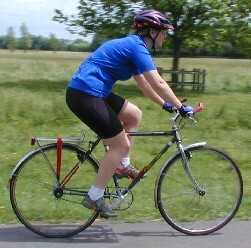 An alternative way of getting the handlebars higher is to have a sloping top tube, which results in a longer head tube. While this Cannondale fit me well and handled beautifully, it had a few problems. First, it has a fairly steep head angle of 73 degrees, which means that despite having smaller (650c, ISO 571mm) wheels, I still get toe overlap! Also, the seat tube angle is fairly steep at 74.5 degrees. *Although tires narrower than 23mm are commonly used, 23mm tires are better since they are more comfortable, have less rolling resistance, and are more resistant to pinch flats. Wheel size designations can be confusing. For example, how big is a 700c road wheel in comparison to a 26" mountain bike wheel? The best way to describe wheel size is using the ISO size, which is the diameter of the bead seat of the rim in mm. I will give the ISO size for all wheels I mention. Note that the smaller of these bikes still have long top tubes for the frame size. Nevertheless, the top tubes are shorter than the men's bikes. I would take either the 47cm or 52cm model in order to get my desired 50cm top tube. This would enable me to have a comfy ride, which I couldn't get even on the smallest men's model. Top tubes can be made still shorter than you find on these bikes: the Battaglin that I tested for Cycing Plus has a 45cm top tube. However that bike had very twitchy handling. It had quite a short wheelbase; perhaps this contributed to the unstable handling. Or it may have been a smaller amount of trail; it's hard to know exactly. Also note that the BB height on the three smallest sizes of bike is higher than in should be, so watch the crotch clearance if you're thinking of buying. If you want a smaller wheeled bike for Audax or touring, you would be better off using 26" mountain bike wheels (ISO 559mm). Tires for these wheels come in sizes falling in the Audax and touring ranges. At the moment there aren't a huge number tires in the Audax range, but the selection is growing all the time, and even now there are enough tires by manufacturers such as Ritchey, Panaracer, Specialized, and Continental, that you would be able to fine a tire that suits your needs. In the touring ranges the selction is better. People who tour with MTB wheels tend to use wider tires than they would using 700c tires. It seems that 1.5" (38mm) is the norm, with a 1.25" Tioga City Slicker or 1.3" Vredestein S-lick (which are roughly 33-36mm wide) being about the thinnest people use. Touring bikes with 26" mountain bike wheels are getting quite popular. Orbit makes a few (the Romany and Caraway, and their especially-for-women Mercury); Roberts do the custom Rough Stuff; and Dawes does the Sardar (which has quite a long top tube). But far and away, the best supplier of Audax and touring bikes with MTB wheels are Thorn. They make their Audax bike with 26" wheels for smaller people, and they make another four different varieties of bikes that range from very light & nippy for training and fast Audax riding, to reasonable heavy and nearly indestructible for expedition touring. Below are the specs for the XTC, the Audax/light touring version. Actually, I'm only including a very small selection of the the available sizes: the 6 different seat tube lengths are available each with short, medium, or long top tube lengths. I have included only the short sizes in the chart. Note that the range of TT/frame size ratios here appears to be the same as with the generic (not women-specific) Trek 2000-series bikes. However, this is misleading: the top tubes are sloping, so the "frame size" is smaller than it would be with a horizontal top tube. 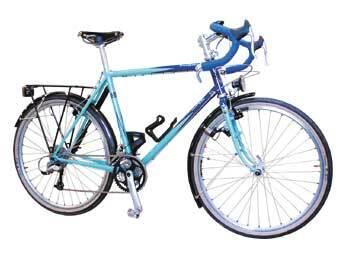 These bikes have shorter top tubes than the Treks, and furthermore are available in smaller sizes than the Treks. The Trek 2000 that comes closest to fitting me is the 50cm one, which has a top tube of 52.3cm. The XTC that fits me is the 47.5cm model, which has a top tube of 50cm, my ideal length! Note also that the bottom brackets are at a reasomable height. Not very low, but low enough to show that Thorn haven't made the seat tube shorter simply by raising the bottom bracket. Different sized wheels on the same bike! Often, these smaller bikes have a steep seat tube angle (74 to 76 degrees), as this makes the top tube shorter. I've noted above why I don't think this is such a great idea. Terry in the US uses smaller front wheels on their smaller bikes to allow a short top tube with a 73 degree seat tube angle while avoiding toe overlap. Terry use 26" rear wheels and 24" front wheels. However, the exact wheel size depends on the model! The rear wheels are MTB size (ISO 559mm) for the mountain bikes and road 26" (aka 650c or ISO 571mm) wheels on the sportier models. On the front the sportier model has an ISO 520mm wheel. The off-road models have an ISO 507mm front wheel. The tires that go with these are rarely stocked in shops, but can be ordered from shops or from Terry. It is hard to make a direct comparison of these bikes with the Thorns, as Thorn don't put the seat tube angles of their bikes in their geometry charts. However, it's probably safe to assume that the Thorn bikes have steeper seat tube angles than 73 degrees. Note that the smllest top tube we've come across on any of these bikes is 48cm. Since I take a 50cm top tube, this doesn't really fit a person much smaller than I am! What can you do if you're smaller? The first thing to consider is to abandon drop bars. Using straight bars instead brings back the reach a great deal, as the main grip area on flat bars is even with the stem instead of quite a ways forward of the stem for road bikes. You can also use a shorter stem as MTB bars are wider. You could easily put straight bars on the Thorn XTC, or even use a simple MTB or a women's specific MTB with skinny slick tires. If you want to stick with drop bars, you'll have to either put up with a top tube that's quite a bit longer than your seat tube, or go custom. One custom approach is to use the tricks Roberts does, but applied to MTB wheels. Or take the Thorn proportions, and use it on smaller wheels than MTB wheels, say the size of wheels Terry use on the front of their bikes. If you want a very sporty bike (with skinny tires, say 23-25mm and no mudguards), you can use the Thorn design, but you'll be able to bring the front wheel closer to the bottom bracket (since the skinny tire will take up less space than a 1.5" tire plus mudguard), allowing a top tube that's at least 2cm shorter. All these require the active participation of a framebuilder who knows exactly what he's doing. Don't have $1000 or 1000 pounds to spare? Unfortunately these bikes are very expensive. Almost all of them are $1000 or 1000 quid or more. The only ones that aren't are the Orbit Mercury bikes. They are available in race (with 650c wheels) and tour (with MTB wheels) form. The touring bike is available either with drop bars or straight bars. These bikes are well designed with inexpensive but correctly fitting parts, and they also come with short 160mm cranks. Despite being built with an eye towards economy they're around 500 pounds. Much less expensive than the others, but still a fair chunk. If you can't afford that, then I'm afraid you'll either have to put up with a top tube that's a fair bit longer than the seat tube, or abandon drop bars and go for the MTB solution. Pamela Blalock's comments on women's bike fit. Chris Juden's test of touring bikes for small women.